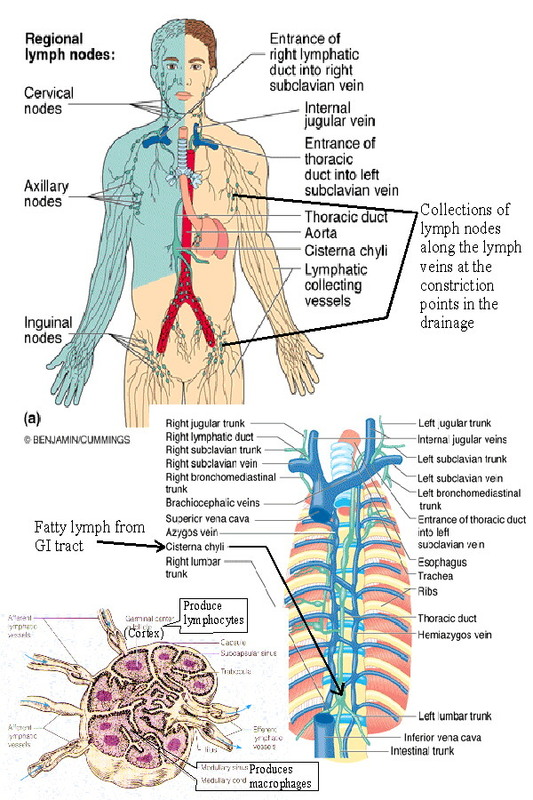 Lymph nodes are a part of the lymphatic system; they are glands that produce a substance called lymph. This substance moves throughout the body via lymphatic vessels, removing impurities from the body and fighting infections. Some lymph nodes are easily felt with your fingers. Swollen lymph nodes are a sign of infection. Lymph nodes are located in a series along the front, sides and back of the neck. Lymph nodes are also located under the jaw and chin. Lymph nodes can be felt behind the ears. Lymph nodes can be felt at the back of the head, right above the hairline. Lymph nodes can also be found in the armpit area. Another area where lymph nodes are easily felt is the groin.